Over the last few generations of iOS, we have seen Apple adding a bunch of new and useful features in the Accessibility options. It seems that they aren’t taking their foot off the gas just yet, with iOS 7 beta introducing a number of new device control methods for those who may need to interact with their devices using head-based gestures. As with any iOS or OS X beta, we are seeing a number of users carefully inspecting the software to find any inclusions that weren’t mentioned as part of the WWDC introduction keynote speech by Tim Cook and his team. Although Cook and his crew only really covered the main aspects of iOS 7 beta, there are always going to be in-development sections of the firmware that could appear in beta releases but never actually make it to the final product. One anonymous iOS 7 tinkerer has delved deep into the Accessibility settings and found that it includes options to switch control methods that would allow us to use left and right head movements to make menu selections. 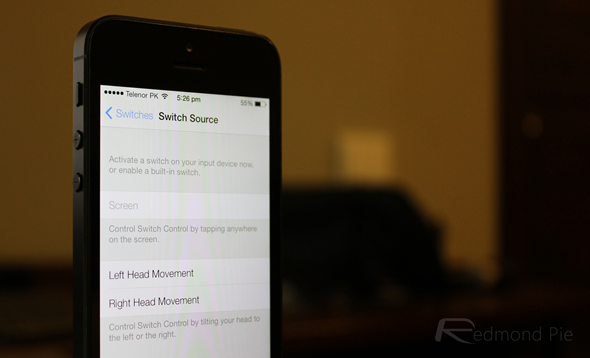 The current Switch Source options allow the user to use a third-party device for control, or to activate one of the built-in control methods that Apple ships with iOS 7 beta. When enabled, a selection box cycles through each available option or selection that is currently visible on the screen and allows the user to use the defined head movement to select that particular option. If a section is selected rather than an option, then a checked box appears and the cycle process begins again on the selected set of options. Anyone who has found this setting and actually tried it out will understand that it represents a fairly tedious way of interacting with the device. With that said, offering this kind of accessibility feature could prove to be the perfect interaction method for users who have limb affecting disabilities, and once again shows that Apple are committed to putting the iPhone and iPad into the lives of as many people as possible. It’s unknown whether or not this feature will make it into the public build of iOS 7 this fall, but for the time being it’s another new part of Apple’s future.